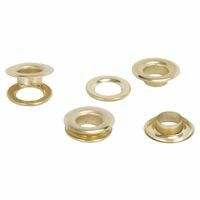 Solid brass fasteners with nickel plating will not rust. Used to repair canvas, tarpaulins, tents, awnings, sailcloth, lawn furniture and pool covers. contains 6 snap fastener sets. Solid brass fasteners with nickel plating will not rust. Used to repair canvas, tarpaulins, tents, awnings, sailcloth, lawn furniture and pool covers. Contains 6 screw snap fastener sets.